I went to Kristianna's baby shower on Saturday, and was finally able to present her with Fredenburg. Those aren't Kristi's hands holding up the finished product, but a very helpful woman who was trying to help me get good pictures. 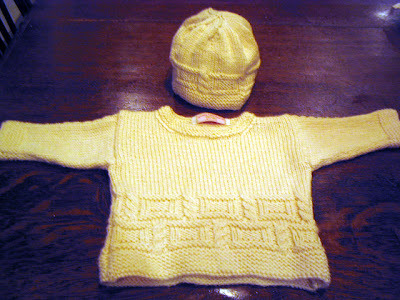 After finishing the sweater, though, I thought that something was missing. 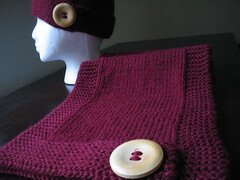 I thought that the sweater wouldn't be complete without a hat to match. So I designed one. 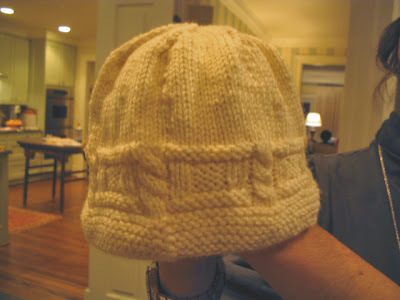 The hat has the same pattern as the pattern on the bottom of the sweater. 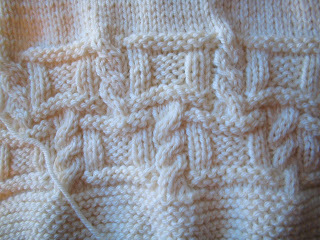 And here's the pattern close-up, for those who can't see it well. Kristi loved it. I wish I could show you pictures of Kristi, because she was too cute with the pregnant belly. 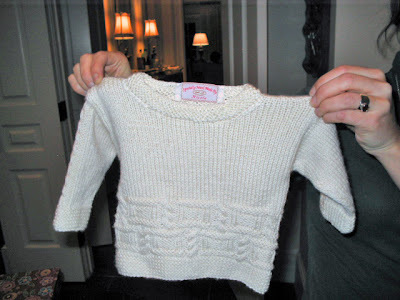 I didn't get permission to show pics from the baby shower on the blog yet, so I'm not going to post any until I do. 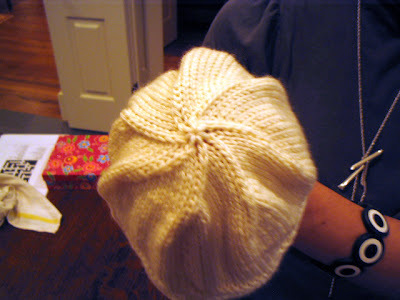 I'd originally knit 1" of garter stitch on the neck, but ended up ripping out some rows because I didn't think that it would fit comfortably over the baby's head. I think it should be wide enough now. 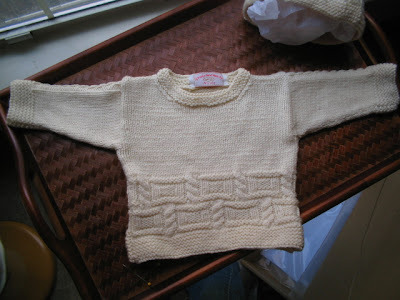 In the future, I'll design baby stuff with a buttoned neck that would be "baby head friendly". 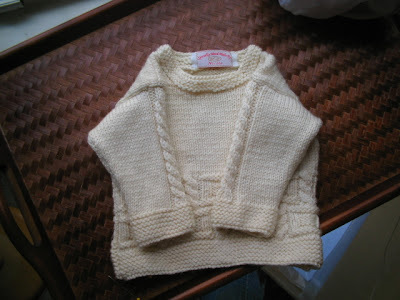 Or design baby cardigans. I loved that baby shower. I met some wonderful women there, including Kristi's Harley riding, chaps wearing, mother-in-Law. I loved her. When she told me she rode, I didn't believe her because she seemed like a mild mannered woman. That is, until she showed me pics. You Go Girl! One of the women I met, Chi-Chi, was very pleasant to talk to and loved my Republic Hat. So you know I had to make her one, right? 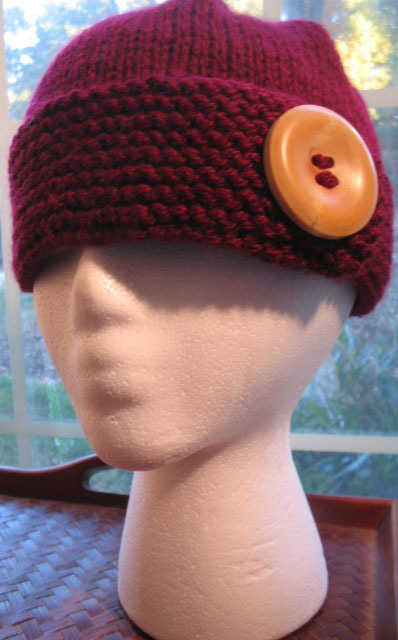 You know we knitters love to make stuff for people we know will love what we make for them. 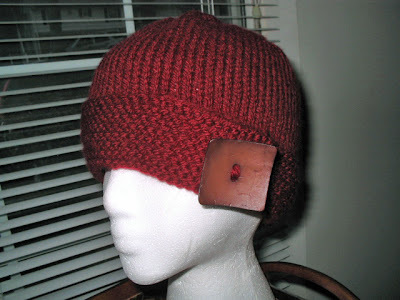 Your hat is ready, girl. All I need is an address. Don't you just love that natural wooden button?